The popular idea of art as ‘creative crafting’, stretching from arranging flowers in the home to classical oil paintings in museums, is, when all else is said and done, centred around the idea of ‘taste’. ‘Taste’ is itself a matter of ‘sensual aesthetic sensitivity’, in which we focus our attention on the sensual features of presentational art forms – from music to ballet to sculpture to poetry, and everything else besides – and enjoy them for the pleasurable effect they have on us. Our appreciation of these sensual features can of course be educated and refined, and we take refinement of this sort as a sign of culture and sophistication. And the core capacity that we educating and refining – in artistic terms – is our ability to discriminate the finer points of sensuality, in essentially the same way as a gourmet refines their ability to taste food. The artistic connoisseur and the food gourmet are both engaged in exactly the same kind of quest for sublime sensuality. If aesthetic sensual refinement is to be understood in a measured way, it needs to be situated in the context of everyday life, and against the backdrop of ordinary human motivations. Most of life is spent dealing with competitive striving for money and social success, and these demands leave very little time left over for anything else. Which means that spiritual, intellectual and artistic needs tend to be pushed into a corner, and then dealt with in a confused and fragmentary fashion, with only vague ideas to guide us. So the occasional visit to a gallery, and the occasional concert recital, come to be seen as meaningful enhancements to our inner lives as a somewhat mystical process. But what gets lost sight of – because it is not really seen for what it is – is that sensual refinement doesn’t really advance anything other than itself, except if you indulge in mystical thinking, and tell yourself that your subtle sensual experiences – such as standing before a classical oil painting and saying to yourself ‘how beautiful !’ – is of the same stuff as enjoying an exquisite meal prepared by a celebrity chef. We might like to separate the experiences in our minds, and rank one much higher than the other, but this doesn’t bear closer examination: sensuality is sensuality, and the current popular conception of ‘art’ has it that art is about educated sensual refinement of one sort or another. Where else to go ? Well, modern art has, wittingly or unwittingly, introduced a new dimension to presentational material which takes us into narrative territory of a complex and demanding kind. Narrative content is of course standard in plays, films and novels, but we don’t tend to think of these as ‘arts’ except when the element of ‘creative crafting’ is very noticeable, such as in an ‘arty’ film filled with unusual camera angles or a convoluted plot. We also tend to think of narrative as being about ‘storylines’, with a sequential story arc, but modern art has shown that other forms of narrative are possible, involving experiential immersion and the taking on of entire ‘frames of mind’. To understand an artist like Joseph Beuys, for example, you have to be able to connect with his peculiar angle on life, and not be distracted by the lack of classical sensual qualities in his artworks. How is this a new conception of art ? For a start, it has little or nothing to do with ‘aesthetics’, meaning the sensual appreciation of beauty. ‘Art’ becomes instead a matter of orchestrating elements of a particular artform in the service of narrative, not in the service of sensual attractiveness. 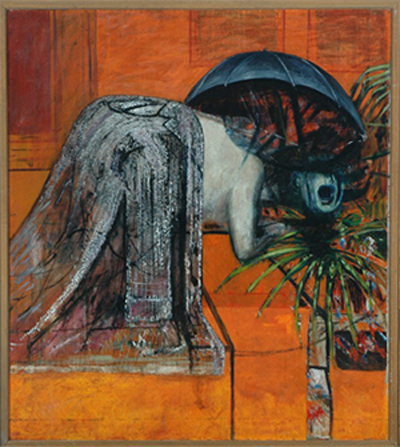 A Francis Bacon painting is about the revelation of a certain type of unknown world, and if we want to appreciate it fully, we need to be able to enter into that world as best we can, connecting with it through the painting. This is not about imaginative reveries or resonances, this is about connecting with what we see, directly, as if we had been shown a window into a mysterious landscape. What is this realm Bacon is revealing to us ? We may not be able to put it into words, but this mysterious experiential possibility – this ‘narrative’ – is what his paintings are inviting us to engage with. This is what his paintings really ‘mean’, in the truest and fullest sense. And the more demanding and revealing and unsettling the narrative, the better the art. Not every narrative is ‘artistic’ in the sense we are defining it here: for ‘art’ to be properly ‘art’ it needs to tell us something we don’t already know, otherwise it is simply presentational crafting, like an ordinary play, film or novel. ‘Ordinariness’ is, at best, reassuring; ‘art’ needs to be unsettling for it to qualify as authentically art.